Who was Albrecht of Mecklenburg? Would you like to know more about Albrecht of Mecklenburg? Read more about his life here. King Albrecht I of Sweden has already been presented by name in a number of articles, but until now we haven’t really had the opportunity to get to know him. The man that was to be Albrecht I of Sweden, was born around 1339 (the sources state everything between 1338 to 1340) as the second son of duke Albrecht II of Mecklenburg (1318-1379), and Eufemia Eriksdotter (1317-1370), sister of the Swedish Magnus Eriksson – a man that was to be contesting with Albrecht of the throne. In other words – these relationships made our Albrecht next in turn to the Swedish crown, after king Magnus Eriksson and his son Håkan. Albrecht’s father ruled the Mecklenburg area at the north coast of Germany between 1329 and 1379, and that was a task that would later pass on to our Albrecht after his elder brother Heinrich (III von Mecklenburg) had died in 1384. Speaking of Heinrich – he married Ingeborg Valdemarsdotter, daughter of the Danish king Valdemar. Heinrich’s son, Albrecht IV of Mecklenburg, would later take part in the struggle for both the Danish and the Swedish thrones, as he was Valdemar’s grandson. Apart from Heinrich, Albrecht had three siblings: Ingeborg, Magnus and Anna, but none of them played any significant role in Swedish politics. When Albrecht got the opportunity to be the king of Sweden, he was in his early twenties. He came from a relatively small area in northern Germany, but what his country lacked in size it regained in diplomacy and ruthlessness. Still, it must have been hard stepping onto a throne in a country where everybody behaved differently and, for the most part, saw you as either a tyrant or a puppet – even with your experienced father backing you up. Albrecht went through a number of difficult situations, which he handled with various amount of success, before he retired to Mecklenburg to rule the area until his death. Albrecht married Richardis von Schwerin, the daughter of Otto von Schwerin, the year 1359. A contract of marriage had been set up in Wismar seven years earlier. The couple had at least three children; the sources indicate another daughter, but this is not confirmed. The three children were Erik (1359/1365-1397), which was to be Albrecht’s successor for the throne of Sweden, Richardis Katarina (born 1370/1372-1400) and Johann. Richardis died in 1377, and Albrecht married Agnes von Braunschweig, the daughter of Magnus von Braunschweig, the 12th-13th of February 1396. They had a son in 1397, known as Albrecht V. He didn’t get any children of his own, and died in 1423, only 26 years old. 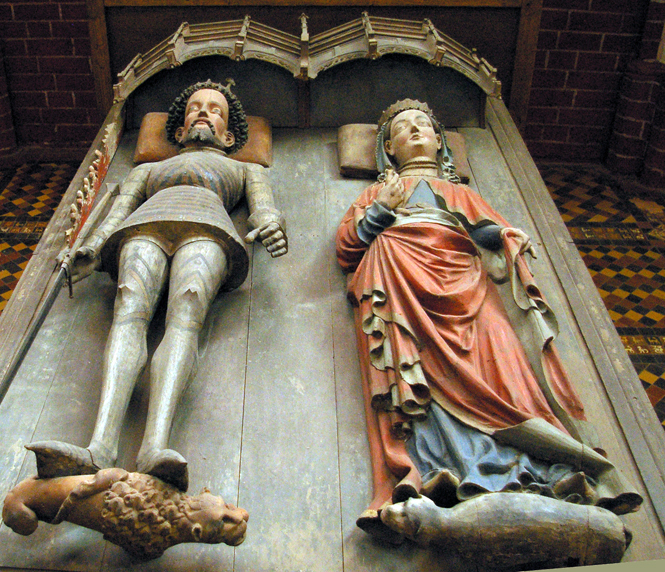 Albrecht himself died the 31st of March or 1st of April 1412, the same year as his nemesis Margareta, and was laid to rest in the Doberaner Münster church, close to Rostock. This entry was posted in Articles and tagged Albrecht, Germany, History, Mecklenburg, Politics, Rickardis, Scandinavia, Sweden by Peter. Bookmark the permalink.